Making it easy to buy petrol – Not. When I first started driving my own car I had to start buying petrol. This was back in the 1980s when petrol was a lot cheaper and a much easier experience. There were even people who’d put petrol in your tank for you, wash the windscreen, and check the tyres, oil and water. They’d even take your money and give you the appropriate change – all without you getting out of the car. Of course this was before credit cards were widely used. Does this type of service happen anywhere anymore at a petrol station? If so I’d like to know. But that aside, petrol stations were places to buy petrol and that was pretty much that. This was before the days of big supermarket chains offering fuel discounts too. Now, I tend to avoid that place whose name suggests that you can get things quickly, as if you were running past. It might be a convenient place to get a coffee, some takeaway, some milk and bread, a chocolate bar, or cigarettes but it sure isn’t a convenient place to buy petrol. Why is it that a person buying petrol has to wait for the three people in front of them who want a coffee? This coffee making takes at least five minutes and there’s invariably only the one person available to make the coffees and take money from petrol purchasers. Something that’s supposed to be pretty quick and easy all of a sudden is no longer quick and easy. After ‘popping’ into one of these places, that suggests that pop in is all you will do, I spent far too long in the queue waiting to pay for my petrol while the people in front of me purchased everything but petrol. The person working behind the takeaway food counter nearby didn’t pop over to help. I guess sharing services between counters is not something that is encouraged in the place whose name suggests that you can pop in quickly. Now I tend to avoid these places like the plague. 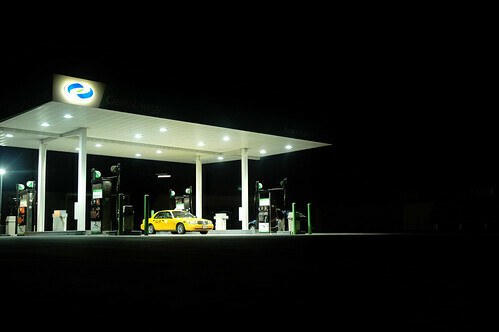 The trouble is they’re popping up all over the place and the little independent petrol station is all but extinct.